Manoj Deka’s brutal murder by Asam police in the name of counter insurgency operation holds multiple shocking implications about current politics in Assam. Manoj Deka was a senior leader of the Communist Party of India, Assam and held the post of the Morigaon district CPI General Secretary. On 1st July 2008 he was stopped by the Assam police while returning home from the market and searched. He showed his bags and let him be checked. This was lead by the Officer in charge Kamal Bora and a PSO Rafikul Hussain.With the pretext of ‘searching’ the commodities bought from the market were poured down on the road and when Deka protested he was insulted, pushed with great force that he hit a nearby electric pole and fainted. Soji Ram sowed Amrita wheat in the beginning of rabi season last year; it is a contemporary version of the indigenous Malwi strand, over 0.3-hectare (ha) last rabi season. Amrita has been developed by the Indian Council of Agricultural Research (ICAR) at its Indore wheat research station. Amrita does not need much soil preparation; what it needs is only two rounds of irrigation. Over at the State of Nature, Girish Mishra writes on globalization’s impact on culture. The on-going process of globalization lays great stress on technology, which implies two things, namely, “machinery and the mental habits conducive to a dead thinking.” “Examples of such thinking are everywhere. We build mechanical connections between people and we call that the” infrastructure of community. “We convert the natural world into massive data sets, and we call that “ecological understanding.” We send trillion-dollar capital flows streaming daily through the world, seeking nothing more than their own mathematical increase, and we call that ‘social development.’ This is machine thinking. The first communist Speaker of Indian Parliament Somnath Chaterjee is the son of one of the founders of the Hindu Mahasabha- NC Chaterjee. The current issue of Frontline has a series of articles on ‘The March of Neo liberalism‘, including one by economist Utsa Patnaik on the agrarian crisis. The story starts from 1991 when Manmohan Singh as Finance Minister started hounding farmers by reducing the fertilizer subsidy, cutting development expenditures so sharply that per capita GDP actually fell in one year and the death rate rose in one State, virtually doubling the issue prices of foodgrains from the Public Distribution System over three years in order to cut the food subsidy (which predictably boomeranged since the poor were priced out and the first episode of build-up of 32 million tonnes of unsold food stocks took place by 1995). 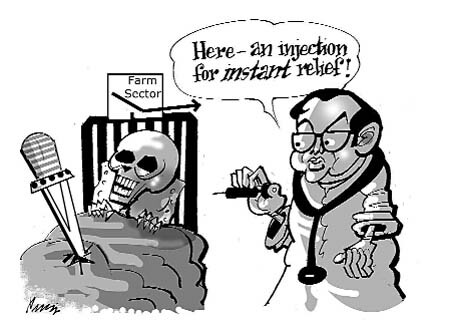 During the NDA period, the complete submission of the government to U.S. pressure and rapid removal of protection to agriculture between 1996 and 2001 – before the deadline set by the World Trade Organisation, resulted in farmers being exposed to the fury of global price declines. Between 1996 and 2001, prices of all primary products (cotton, jute, food grains and sugar) fell by 40 to 60 per cent and farmers who had contracted private debts in particular, became insolvent. The syndrome of hopelessly-indebted farmers committing suicides in Andhra Pradesh and Punjab started in 1998 and rapidly spread to other areas where cultivation of cash and export crop was predominant. The crash in pepper, coffee and tea prices came a few years later after 1998 and farmer suicides in Kerala and insolvency of tea estates in West Bengal date from around 2002. Most alarming is the situation of the Scheduled Castes and Tribes, among whom extreme poverty has increased dramatically during the reform decade, with over three-fifths moving under the lowest level of intake, 1800 calories, by 2004-05 in urban India. Meanwhile, at Foreign Policy, its editor Moises Naim asks whether the world can afford to feed the growing middle class in China and India. “If we continue to grow at this rate, India would be among the most prosperous countries in the world” dominating in education, services and goods…. “Next year, thanks to growth, I will provide Rs 15,100 crore for this scheme. Similarly, in 2003-04 we had provided Rs 1,175 crore for the mid-day meal scheme. The “growth” he is referring to is the 8-10 percent annual growth rate during the “reform” decades, of course. The amounts mentioned for his schemes are drops in the ocean of poverty that may engulf the small islets of “growth” in urban India, sooner than later. Of late, I have been wondering if I need to go back and re- read Mao’s thesis on the villages encircling the cities. As to India soon dominating the world in education, it is a joke in a country with the world’s largest illiterate population and the UPA government’s continuing disinterest in it. Budget Bonanza for the Indian Farmer! The Rs. 60,000 crores loans waiver to the small and marginal farmer is little more than the corporate taxes foregone by the government in a year. Yet, we have IBNLive pose a rhetorical question in a most dramatic manner. No one, however, seems to be “stunned” at the thought of who bears the brunt of the taxes not paid by the corporates. Sagarika Ghose’s Farming the Colonial Dream purports to be a criticism of policy makers, “leftist intellectuals and politicians” as well as certain type of journalists. In essence what the article suggests is that wasteful schemes like the National Rural Employment Guarantee Scheme (NREGS) need to be discarded, agriculture needs to be liberalized and mass migration from rural hinterland encouraged to enable the people to move into manufacturing. In the course of her ‘argument’, Ghose takes a few potshots at un- named “celebrated journalists who have made the “rural areas” into their personal visiting cards” as well as “careerists of poverty, the vote-seeking politician, and the westernized romantic.” There is nothing in the article that, however, suggests that she herself belongs to a different universe. Perhaps as not to be accused of being a ‘Westernized romantic’ herself, she deftly alludes to the Chinese way where mass migration from the villages to the cities is ostensibly paving the way for the uplifting of the impoverished rural masses. After having disarmed the windmills, Ghose goes on to demolish the NREGS lock, stock and barrel for an aim which was never intended for the NREGS. She accuses the NREGS of “ignoring a basic right of every Indian, that is the right to migrate …The right to migrate is an inalienable right and applies to every Indian equally.” Not just that, “according to the NREGA, the rural poor must stay trapped in their socially unequal and violent villages, and undertake meaningless exercise in earthworks to be then handed a paltry wage”. Wow! The NREGS seems to be having a dramatic impact on rural India ! This, however, is not really the case. Recent reports, suggest that the scheme with Rs. 15,000 crore in its first year has been nothing short of a failure benefiting just about 7- 10 percent of the intended beneficiaries (link). (Jean Dreze and associates on NREGA). She herself is closer to the mark when she acknowledges later in the same article that “the NREGA, at best is a semblance of a safety net for the absolutely destitute, that those surviving by eating worms on riverbanks, can be assured of some food for a few days, if that.” If that is the case why accuse it of holding back the “rural masses” from the urban paradise in the first place? One, however, cannot disagree with Ghose’s assertion on the “socially unequal and violent village”, but the urban landscape hardly offers a better picture for the migrant poor. With the prices of houses in cities sky rocketing, even the middle classes outside the IT and BPO sector shudder at the thought of owning a flat. For the urban poor, in the absence of any worthwhile housing schemes by the government, the situation is deteriorating fast. In the 1980s and 1990s, China was alone in the developing world to construct decent housing for the urban poor. Even then, the population of slum dwellers in China is as high as 193.8 million, or 37.8 of the urban population, compared with India’s slum population of 158.4m constituting about 55.5 percent of urban dwellers. (Planet of Slums by Mike Davies, page 24). Worse still is Ghose’s recipe. Liberalize the agriculture sector, she says, which for her means abolishing ceiling laws that impact the farmers’ mobility. Not a word for the landless, not a word for land distribution as if something like land reforms did not exist. If at all it exists, it does so only in the sense of ‘buying and selling of land’. While accusing others of ‘glorifying a monolithic rural India’, she herself does no better. What does one do for those who do not own any land at all? Though the landless do not seem to exist in her article, implicitly Ms Ghose’s recipe for them is to send them to the cities, along with those smart farmers who can now easily sell off their land under a liberalized agriculture. In that, Ms Ghose discovers the solution in China. That only 20 per cent of our GDP comes from an occupation in which 60 per cent of Indians are trapped against their will, should wake up the babus and ministers to the fact that agriculture equals poverty and the only way out is to follow the Chinese example by creating avenues to allow the millions to move out of agriculture into mass producing industry. China has done exactly this with tremendous success. The descendants of Mao have got over their “farmer glorification legacy” far quicker than us. The trouble with those who call for copying China today is that they want the thin icing without the cake, that is to copy everything minus the Chinese Revolution itself ! She ignores what is practically an urban nightmare in China. 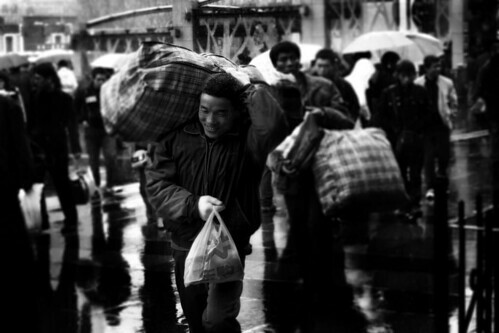 Overwhelming migration from rural areas, a reversal of the 1960s forced migration, has led to increasing social problems. While uprooting the people from their villages and providing cheap, unprotected labour in a country that does not permit forming of labour unions for unrestricted exploitation so severe that in many areas, there is a reversal in trends with people migrating back to villages (link). The example of the Chinese peasants who are ostensibly migrating to the cities to become productive clogs for industries manufacturing everything from diapers to electronics for the Western consumers, is a cruel joke which would be hilarious were it not just sad in its implications. In the same book He Qinglain (page 179-80) points to the increasing tendency to form criminal gangs in urban China. That is the direction that the Chinese path leads to. This is at a time of an overall boom in the manufacturing sector and the absence of a recession in the developed world, which is what has sustained China’s growth. One wonders what the situation will be at a time of decline. Whatever be Ghose’s motivations for such a misdirected ‘solution’ for rural Indians, the fact is that rural India has always subsidized the city. Those who claim that India needs to move away from its ‘socialist’ past are actually treading an extreme version of broadly the same path as the ruling classes have followed since Jawaharlal Nehru’s time, using whatever little pretensions it had to being ‘socialist’, as a punching bag. People like Ms Ghose would like the amount for rural development to come down further so that the largesses can be given to urban India. Perhaps in her universe, all urban Indians own companies. In reality the corporate beneficiaries are not even one percent of the population. But then, perhaps it does not matter. This BBC talk on Albert Camus reminded me of my own enriching encounters with the writings of the Algerian born French existentialist many years ago. Existentialism did not appeal to my primarily Marxist leanings, not even Sartre’s philosophical works and his attempts at synthesis of Marxism and existentialism had any long lasting impact, though the writings of Sartre, Beauvoir and Albert Camus instigated one to think critically. Even then, it was their literary works that held greater appeal. Some of the most influential works I was introduced to after having read the English and Russian classics, were those by these three writers. Camus, especially his novels The Outsider, The Fall and The Plague opened up a new landscape for me. In case of Sartre, I found his literary works like Nausea, very difficult to read. Funnily, his philosophical writings (like the supremely unreadable A Critique of Dialectical Reason) appealed more, despite their languid dreariness. Sartre was a hero for us, mainly for his political stands and the fact that he continued to be a Marxist of sorts. Camus, on the other hand, despite his one time membership of the Communist Party (or perhaps because of it, some would aver) disowned Marxism, and was hence pretty much dismissed as a renegade. The only major philosophical work that I remember reading, with some trepidation, is The Myth of Sisyphus (of which my friend Rahul Banerjee is very fond of, incidentally.) The absurdity that the French existentialists spoke of did not strike a chord even then. However, lately I found reading some of Camus’s philosophical works like The Rebel, Resistance, Rebellion and Death to be rather pleasant, which is perhaps a reflection both of the distance I have traveled since, and also the relative obscuring of ideological debates and dilemmas since Camus’s times. It is still difficult to accept the ideological and philosophical positions of Camus, and as the talk on BBC radio indicates, Camus’ literary writings will rightfully outlive his philosophical works. (Link to the BBC Talk via the excellent blog Ready Steady Book blog that I discovered today). 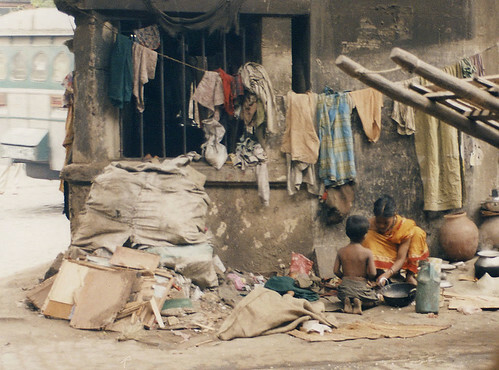 P. Sainath writes on how post- reform poverty differs from that of pre- reform era. Poverty is, after all, as much a relative phenomenon as an absolute one. The average monthly per capita expenditure (MPCE) of the Indian farm household is a long way from Rs.15 lakh. And further from $115,000. It is, in fact, Rs.503. Not far above the rural poverty line. And that’s a national average, mixing both giant landlords and tiny landholders. It also includes States like Kerala where the average is nearly twice the national one. Remove Kerala and Punjab and the figure gets still more dismal. Of course, inequality is rife in urban India too. And growing. But the contrasts get more glaring when you look at rural India. About 60 per cent of that Rs.503 is spent on food. Another 18 per cent on fuel, clothing, and footwear. Of the pathetic sum left over, the household spends on health twice what it does on education. That is Rs.34 and Rs.17. It seems unlikely that buying unique cellphone numbers is set to emerge a major hobby amongst rural Indians. There are countless households for whom that figure is not Rs.503, but Rs.225. There are whole States whose average falls below the poverty line. As for the landless, their hardships are appalling. “The average top 0.01 per cent income was about 150-200 times larger than the average income of the entire population during the 1950s. This went down to less than 50 times as large by the early 1980s. But went back to being 150-200 times larger during the late 1990s.” All the evidence suggests it has gotten worse since then.